My journey has officially started. I left Tallahassee Monday, Oct 5, and made it to Philly without any problems. I met a fellow PCT (Peace Corps Trainee – get used to the acronyms now) at the airport in Charlotte, so we shared a cab to the hotel then had lunch (cheese steaks, what what! When in Philly…) before our brief orientation. Our session lasted about 4.5 hours, and we were given a bit of information about our lives for the next 2+ years, in addition to some administrative stuff. We had our last American dinner out on the town in Philly, then a few of us walked to see the Liberty Bell…quite patriotic. The following morning we had a very early breakfast at the hotel, then got yellow fever vaccines before driving to Newark, our point of departure. Our arrival to Addis went swimmingly (didn’t have to make use of our schwimmweste on the airplane!) We arrived around 7 at night and were taken to our hotel. If you’ve never traveled with 40 people in a group, you should sometime, just to see the amount of luggage – and we were all limited in the amount we were able to bring! We had orientation for the next 2 days in Addis Ababa (the capital city of Ethiopia), along with a few (only 4) shots. We were introduced to the Peace Corps more in depth and given some information about what we’ll actually be doing here, as well as a detailed schedule of our next 10 weeks of PST (pre-service training). 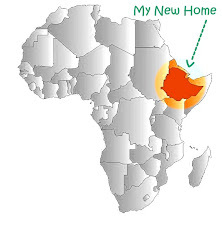 A little bit about my training group: we are group 3 to return to Ethiopia. There are 42 of us, spanning across the country and quite an age range. There are 4 married couples among us. We were all together during our time in Addis, but have since been split into 4 smaller groups for training purposes. We are doing a community –based training, where we will live with a host family in order to really integrate into the community/culture. More, more, I want more! Are they feeding you, are you healthy, are you finding it interesting, how is the weather etc... I am really, really looking forward to hearing all about it. I have an international card and will try calling tommorrow - early afternoon - early evening.